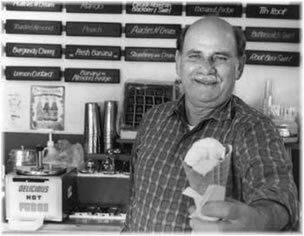 Sam was known as “The Guy Behind The Counter.” For over 55 years, Sam served up scoops and handed out smiles. His dedication to quality and fun lives on in our hearts every day. One of the best parts of being in Santa Cruz for almost 70 years is that so much history has happened at Marianne’s. Tell us the scoop, whether it’s a first date, worst date, first kisses, last hurrahs, engagements or weddings; we’d love to hear your Marianne’s story. We are especially interested in pictures from the early days of Marianne’s and stories of the Becker’s and Sam and Dorothy. Each month we are going to choose some of the submissions to feature here and if your story is chosen we’ll hook you up with some FREE scoops! We’ll take good care of your story here at Marianne’s Ice Cream and will do our best to include your story on our website. By submitting materials, you agree they may be used in connection with Marianne’s. Who knows, it may even show up in one of the other places Marianne’s is talked about. We won’t be able to return your photos to you, but we promise to keep them safe and sound.